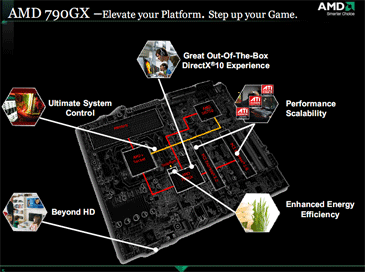 1 - Introduction 2 - AMD 790GX and SB750: What's New? 3 - Overclocking Further? It's been a strange cycle of events if you think about it. 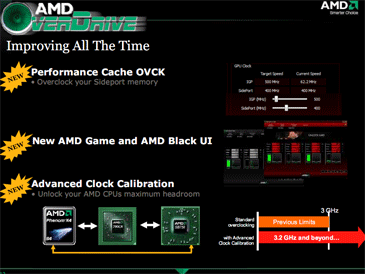 Way back when AMD CPUs came back to socket and the platform was an enthusiast favourite again, AMD relied on VIA and later Nvidia to provide a co-operative performance relationship. 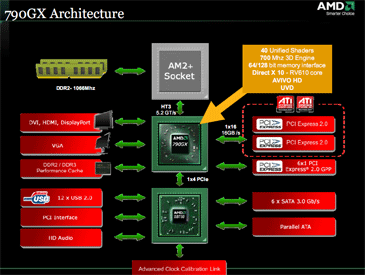 If anyone strains their memory to recall AMD's few and far between chipsets, they'll also remember that (bar the one multi-processor platform) no one actually bought them. We all preferred the KT133, KT133a, KT266a, nForce 2, 3 Ultra and 4 over time until Intel launched Conroe. ATI made a few chipsets too, mostly for Intel platforms, and these were equally pants as the AMD counterparts - the only one we regret not ever seeing fulfilment was the RD600 that only DFI was brave enough to use on its ICFX3200-T2RG (we've still got one on the shelf in the office). News through the grapevine was that apparently AMD ordered ATI to give up on that one shortly after it bought it back in Q4 2006. 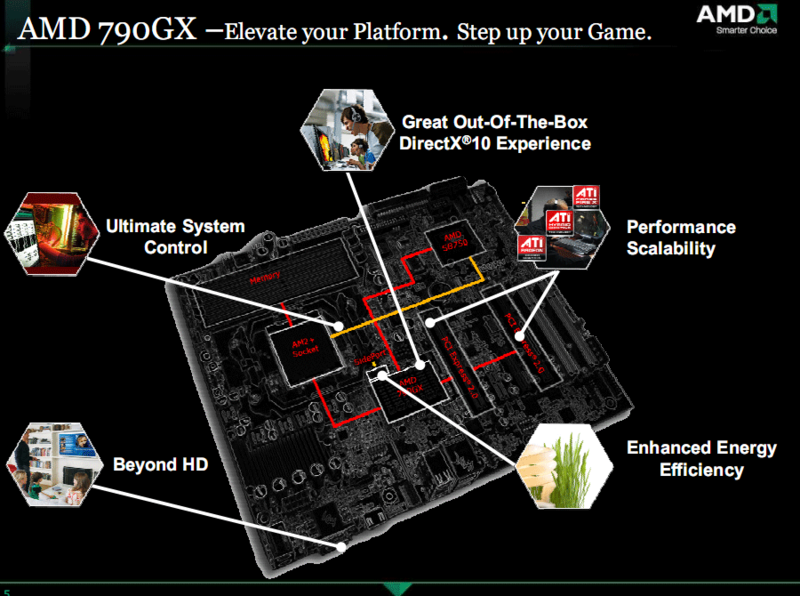 But here we are now, and it's somehow strange when we think that AMD's latest CPUs are not exactly desirable, yet its integrated graphics chipsets: the 780G and now the 790GX are currently and should become some of the performance leading on the market. That is, if you care about integrated graphics. Features wise, Nvidia still has a hand over AMD - it offers not only Hybrid Boost which is akin to Hybrid CrossFire, where a very low end card like the GeForce 8400 GS or Radeon HD 3450 can cooperate with the IGP to give a few more FPS for very little cash, but it also features something AMD doesn't: Hybrid SLI. This is where you can completely turn off the discrete graphics card to save a ton of power, and just use the motherboard IGP instead. Currently the method of its operation is a little crude to say the least, but it is available for all 9-series and GTX 200 series cards. We recently questioned when AMD will have the same and got the same response as when we first asked - when it's ready and only when it works seamlessly, but it wouldn't commit to a date. Another area where AMD lost out on was its epically poor southbridges. At the time in early 2007, SB600 was a revolution AMD needed to claw itself back into the game, but its USB performance was still inferior to both Nvidia and Intel, and it only had four SATA ports. This southbridge was partially replaced this February by the SB700 which offered an upgraded six SATA ports, better ACHI for eSATA and more USB ports with some additional performance, but unfortunately it was still hobbled. Partners using the SB700 had to add an external clock generator, adding to cost - this meant that while it was pin-compatible with SB600, it could only be used on new boards like the 780G, rather than finding its place (where it was needed) on enthusiast 790FX boards. SB710 was reported to replace it but that was quickly canceled and all AMD's efforts were pooled into getting the latest SB750 right out the bag. 7.5th time lucky, eh? The SB750 finally brings AMD not only in line with Nvidia and Intel, by including RAID 5 support and enhanced overclocking with an "advanced clock calibration link" between southbridge and CPU. In addition this has all been tied in quite neatly with some proper software control thanks to AMD's OverDrive and RAIDXpert software. 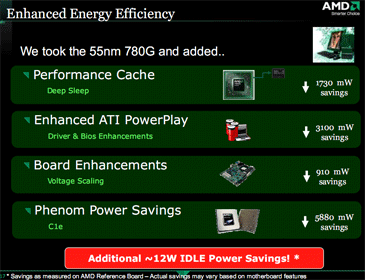 AMD was also keen to point out that since it's 780G, it has made further power savings too. All new AMD chips (bar CPUs) made this year have been built on the 55nm TSMC process, and the 790GX and SB750 are no exception - both only require passive cooling. 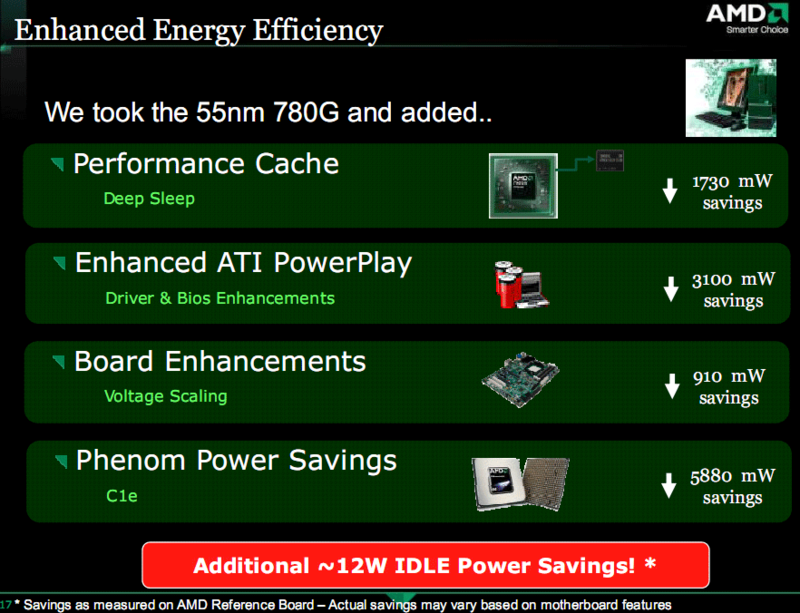 More importantly though, AMD claims that it has saved an extra 5.7W (not including CPU) by board and sleep state enhancements. 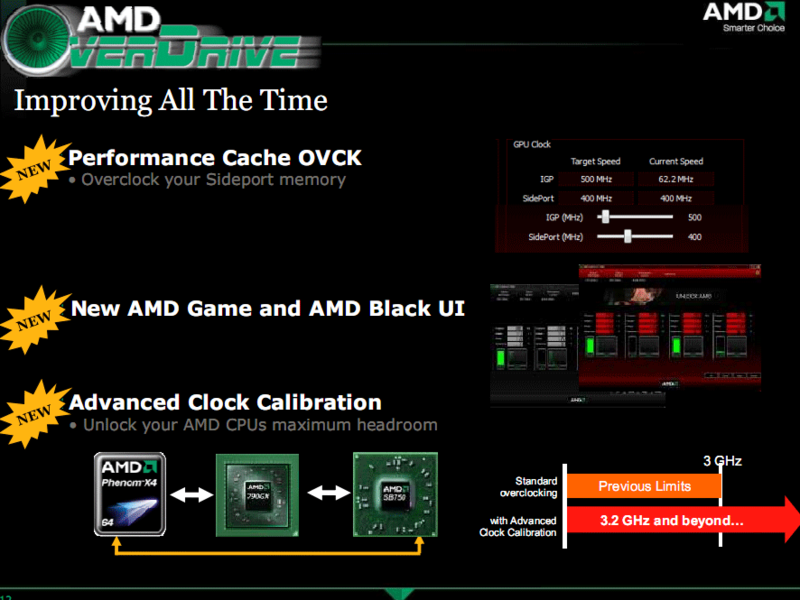 Finally, do we have something to get worked up about from AMD?